Anthony Fletcher. Photo by Yesenia Alvarado/The Et Cetera. In the summer of 1998, 21-year-old Anthony Fletcher knew he was going to get cut from his college basketball team. Angelo State University had hired a new head coach, Joe Esposito, to rebuild a program that hadn’t won many games. Esposito met with each of the players. Many came out of his office crying after being told they wouldn’t be on the team anymore. Fletcher knew his fate before entering Esposito’s office. He would be entering his senior year without playing basketball. He couldn’t do that. He’d have to transfer to stay involved with college basketball. Esposito wasn’t sure about it at first, but Fletcher wasn’t ready to give up. He spoke with the assistant coach and Esposito accepted. Fletcher worked for free as a student manager his senior year and was hired as a graduate assistant coach the next. He worked 60-80 hours a week, sweeping the floor, helping with practice, speaking to recruits, recording the games, doing laundry and whatever else was asked of him as long as he could be part of the team. He also taught a physical education class. He made only $8,000 a year. And he loved it. 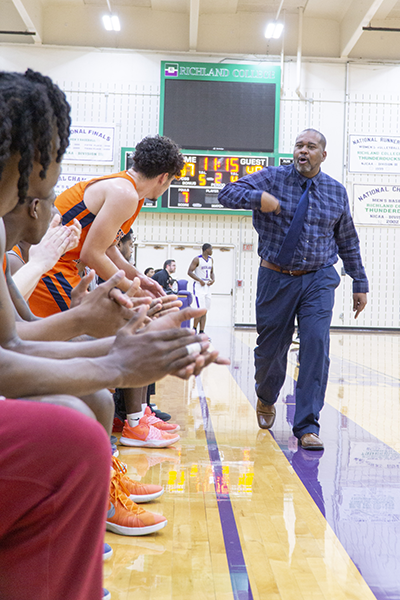 On Jan. 26, in his 20th season as a basketball coach, Fletcher earned his 300th career win. The Harvesters defeated the Cedar Valley Suns in a 112-76 blowout. The team won by 36 points, but in the beginning, Fletcher didn’t know how the game would play out. The Harvesters had suffered two consecutive losses in away games, one against Mountain View College and the other against Richland College. Then, a day before the game, team captain and starter Scott Garriga had a minor ankle sprain that took him out of the game. The Harvesters came onto their home court with a crowd. Players from the volleyball team, students, employees and high school students cheered for the team from the stands. The Harvesters pulled ahead early, and with less than five minutes left in the first half, the team had an 18-point lead. Fletcher yells a sophomore’s name across the court. The player didn’t go into the free throw lane; he knows one of his teammates can get the rebound. Fletcher sends another Harvester in to get him off the court. “He has got to stop,” Fletcher says. As Fletcher walks toward him, he begins to stand. “Sit down,” he says to the player. Haywood tries to explain himself. Fletcher walks the player away from the bench and sets his focus on the conversation. Haywood getting the rebound is a non-negotiable for Fletcher. Scholarships are the most important thing to Fletcher, and good stats help his players have a better chance of recruitment. Haywood is “big and strong,” and because of that, Fletcher knows the best chance of him getting scholarships is having as many rebounds and double doubles as possible. This means being in the free throw line to get rebounds. After games, Fletcher posts his players’ stats on social media for four-year coaches to see. When the team plays well, he knows he has more material for the highlight video he will make at the end of the season. He keeps a detailed list of how many of his students have gone on to four-year colleges, what degrees they earned and their athletic and academic accomplishments. So far, 121 players have moved on to the next level, securing more than $2 million in scholarships, and 108 have earned degrees. Four have been awarded master’s degrees. Kevin Harvey was a shooting guard for the Harvesters from 2009 to 2011. Harvey transferred to the University of Saint Mary and returned to coach and earn his master’s there in 2017. Now he is an assistant coach for their women’s basketball team and expects to earn his degree in May. Harvey said he remembers how much Fletcher wanted players to get a degree and better their lives. He remembers Fletcher sending his highlight tapes to coaches he knew and coaches he didn’t know. “He was just working endlessly for not only me but my teammates as well,” he said. To Fletcher, the 300 wins achievement isn’t for him. It’s for his players. He is already thinking about how his career milestone can help him market them to four-year colleges. 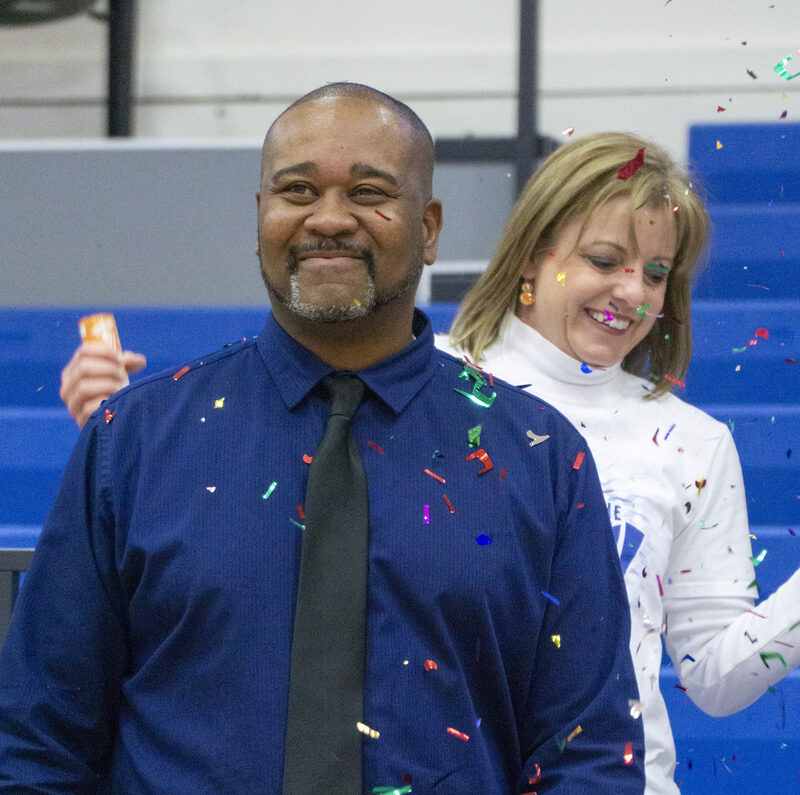 Courtney Fletcher, his wife, said that many of his players get scholarships to multiple colleges, but he does research on the colleges and their coaches to find the best fit for his players. Fletcher has had a lifelong love of basketball. He grew up with a basketball net in his backyard in Mesquite. He remembers trying to coach other kids growing up. “You go there! You go here!” he would holler at the other kids. He first visited Eastfield in 1987 as a seventh grader for a summer basketball camp hosted by former Dallas Maverick Rolando Blackman. Coach Robert Flickner, the former athletic director and head basketball coach, remembers Fletcher from back then. “He was just a delightful little kid at that time,” he said. Fletcher tries to motivate the team during their game Jan. 23 against Richland College. They lost the game 82-74. Photo by Yesenia Alvarado/The Et Cetera. Fletcher played on the junior varsity team at Poteet High School. His sophomore year, his future with basketball became uncertain when he was injured during Christmas break. While playing a game of pickup ball, his friend went for a dunk and Fletcher tried to block him. When they collided, the force was so great it knocked his shoulder clean out of the socket. The dislocation took him off the court for the rest of the school year. As a junior, he didn’t make varsity. Despite his disappointment, he kept playing anyway. After he graduated, he ended up at Angelo State University, but after not playing his senior year, he wasn’t a part of their basketball team. 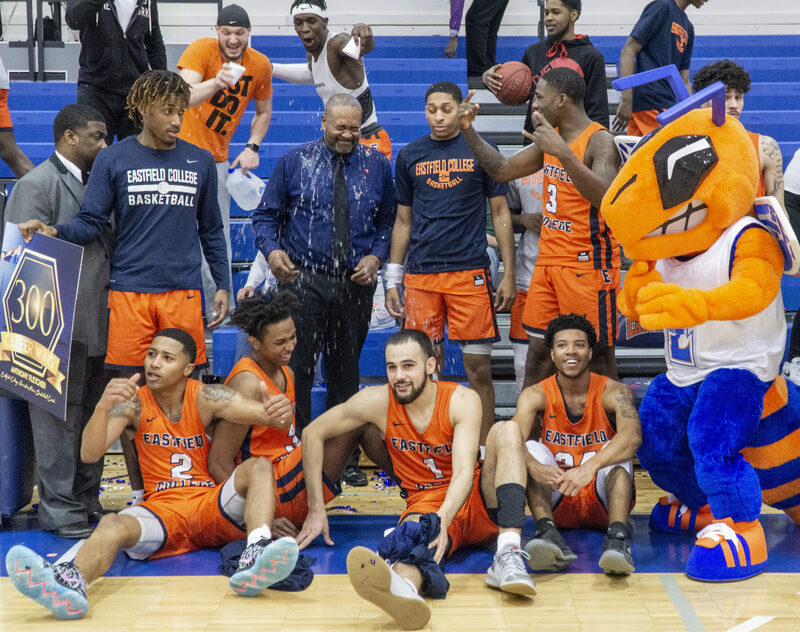 Fletcher had been off the court for two years, but from that moment forward, he did whatever was needed to become a part of the basketball program. He signed up for classes he didn’t need to take, like bowling, to make sure the coaches remembered his name and face, and eventually he earned his spot on the team as a walk-on. He played for the team until Esposito was hired. 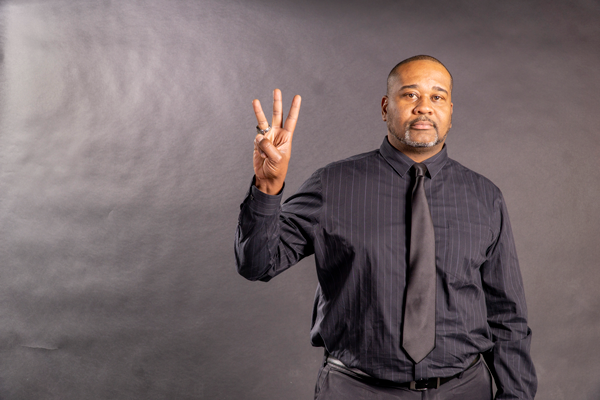 As an assistant coach, he would often drive four hours across Texas to watch a game and four hours back to the college, working 12 hours before he even sat down to do paperwork. But he was learning, preparing for a time when he would get to lead his own program. After games, he and the other assistant coaches would head to Esposito’s house. With a big bucket of Popeye’s chicken in tow, they would sit on the blue, pinstripe couch in his living room and pop in the VHS tape of that night’s game. After each play, Esposito would stop and rewind the tape, over and over again to break down each play. He wasn’t going to stop until every play was reviewed, even if it meant staying up until 3 a.m. When Esposito left the room, one of the coaches would fast forward the tape by 10 minutes or so, hoping he wouldn’t notice, but he always did. This helped Fletcher understand good and bad plays and taught him the work ethic he has today. Two years after being cut, Fletcher, under Esposito’s leadership, would help take the team to a Lonestar Conference Championship win with a record of 11-1. 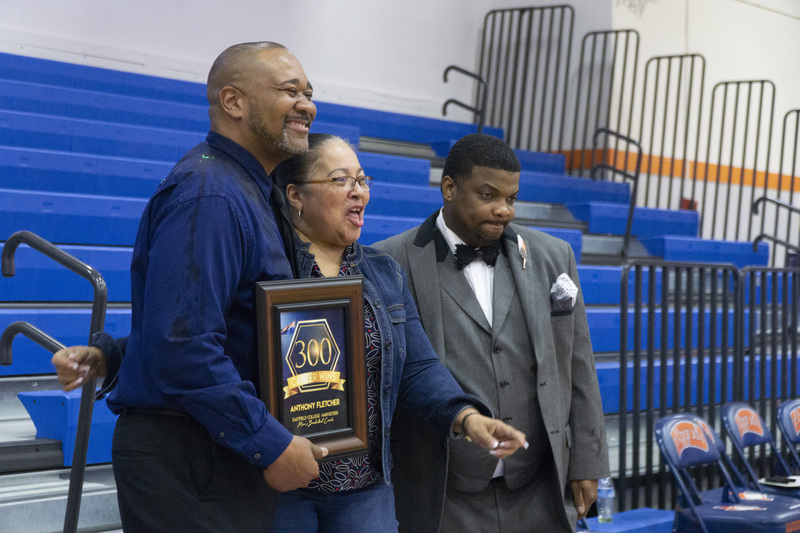 While the Harvesters were earning Fletcher his 300th win, his mother, Olga Fletcher, watched from behind the bench. The team had returned to the court after halftime. In the first five minutes, the team extended their lead to 30. “Rebound! Come on! Rebound!” she yells at the team. Fletcher is following the game closely. He throws his hands in the air and yells before he crosses his arms and paces away from the team. Olga chuckles. He reminds her of what she would have done when she played recreational basketball as a kid. She has always loved the game. “From an educational standpoint, he has a vested interest in seeing all his students do the best they can,” she said. In Fletcher’s family, education has always been viewed as the key to success. Olga Fletcher grew up in public housing in Louisville, Kentucky, and left her parent’s home when she was 18 to pursue her degree at Kentucky State University and earn her bachelor’s degree in sociology with a minor in biology and her master’s in public affairs. Her first semester of graduate school she had Fletcher. When she earned her master’s degree a year later, she saw more opportunity for work in Dallas. Olga started her professional career in the healthcare industry, one she has now had for 40 years. Fletcher was 3 years old when they moved, and she always reminded him that she got her degree. When he acted like he was the smartest person in the room, she would say, “Well, I got my degree.” He hoped one day he would be able to say that back to her. Fletcher saw this as a challenge, he knew from a young age that he was going to get his degree. He got his master’s degree in science, kinesiology and exercise science from Angelo State in 2001. Fletcher met Courtney when she was playing basketball on scholarship at Collin College in 2003. But Courtney, being young, from a small town, and the first in her family to earn a degree would eventually burn out and drop out of college. “I wasn’t quite ready that first go around,” she said. Courtney began driving from Arlington to Waco, where Fletcher worked at McLennan Community College, to see him every week. They would eventually get married and start a family, but Courtney still didn’t have her degree. That’s when she started taking weekend and night classes at Eastfield to show their family the importance of having an education. Fletcher would work all day and go home to watch the kids so she could go to school. Courtney was pregnant with their third child when she graduated with her bachelor’s degree in education, becoming the first in her family to earn a degree. She later earned her master’s degree in teacher leadership and now teaches third grade at Range Elementary School, a five-minute drive from Eastfield College. Beyond wins, beyond statistics, even beyond championships, Fletcher is known to his players as someone who will listen to their day-to-day issues. Fletcher knows that some of the challenges his players face come from outside the realm of basketball. He wants to get to the bottom of what’s bothering them. Freshman Desmond Edwards said he feels like he can tell Fletcher anything. Josh Shockey played from 2012-2014 as a shooting guard. Players do 300 pushups in honor of Fletcher's 300 wins. Shockey got a scholarship and signed to Our Lady of the Lake University. But while he was at Eastfield, he was also interning for a church. His pastor called and said he was looking for a student pastor. Shockey turned down the scholarship. When he called Fletcher with the decision he made, Fletcher was encouraging. Shockey is now a location pastor of Fellowship Church in Fort Worth. Shockey says if it weren’t for Fletcher keeping a relationship with his former players, he wouldn’t have ended up at Eastfield. It was a former player that played a pickup game with him at the gym and gave him Fletcher’s number while he was in high school. Courtney says Fletcher loves building long-lasting relationships with the players. He often receives calls from players years after they’ve left the team. They call to ask him questions, see how he’s doing or tell him about their new jobs and families. Fletcher says when he talks about being a family, some of the guys don’t always take him seriously. Fletcher says he wants to attribute each one of his 300 wins to a player or coach who helped him win the game. Anthony Fletcher. Photo illustration by Yesenia Alvarado and David Silva/The Et Cetera.